THE BOOK: The Ginseng Gang. 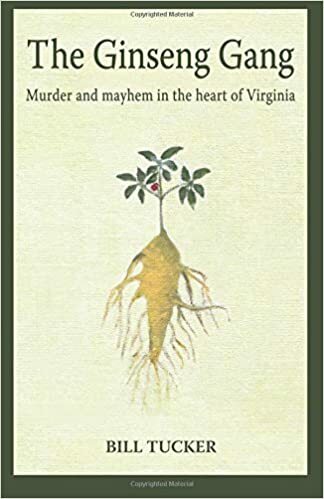 PUBLISHER: Warwick House, Lynchburg, VA.
SUMMARY: The stories and the setting describe an area of rural Virginia where country people still live an easy-going lifestyle — that is, until things start going terribly wrong. A few rowdies and troublemakers do things that cause anger, fear and death.The local law can’t get enough evidence to charge the evildoers, so the Ginseng Gang begins working behind the scenes. WHY THIS TITLE? I know a crazy writer who came up with the title. It refers to the fact that the main characters met while gathering ginseng in the woods. WHY SOMEONE WOULD WANT TO READ IT: Besides an endorsement from Earl Hamner (below), this is a mystery to which babyboomers (and older) can relate — all the crimefighters are of “a certain age.” The book also chronicles a lifestyle that still exists but is quickly slipping away. “I want you to know that I enjoyed every page of ‘The Ginseng Gang.’ I also have to confess that I am still not sure who beat up who, and that it really doesn’t matter. What matters is that you have compiled one of the most interesting collections of folk lore, old folk sayings, the making and consumption of moonshine as well as local and present history in an unforgettable volume.” — Letter to Bill from Earl Hamner, creator of ‘The Waltons’ TV series. “A riveting sequel to Bill Tucker’s first murder mystery novel, Sad Country Song, The Ginseng Gang grabs your attention and holds it to the very last page. A modern day trip down the dusty roads of Virginia’s endearing mountain culture.” — Lynn Coffey, author of the Backroads books and editor of the Backroads newspaper (www.backroadsbooks.com). “Wonderfully crafted story with memorable characters and a surprise ending. Entertaining and engaging.” — Morris Stephenson, reporter, photjouirnalist, former editor of the Franklin County times and author of A Night of Making Likker morristephenson1@yahoo.com). AUTHOR PROFILE: Bill Tucker grew up on a rural Virginia beef cattle farm and and spent hours of his youth hanging out in the local country store, the source of many of the rustic sayings and superstitions that color his book. A 1937 graduate of Virginia Tech with ac degree in animal husbandry, he served two years in the U.S. Army (one of them in Iceland), worked for 20 years as a banker and then ran a commercial food distributorship for 18 years. His wife Gay is an artist, and they have two married sons and three grandchildren. The Gnseng Gang is Bill’s second book, following another mystery, Sad Country Song. CONTACT THE AUTHOR: htgato@gmail.com, 434-384-5991. Sounds like an interesting story. Adding to my want to read list.